Vallejo Chipping Medium. This stuff is addictive. 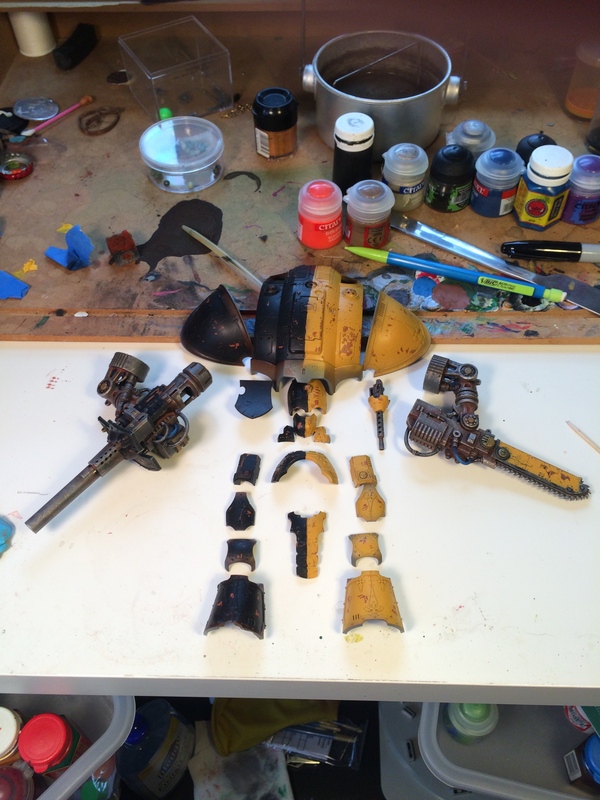 When I started my Knight, I knew I wanted to try a bunch of techniques to show its age. One of them was going to be paint chipping. I had my heart set on it. I watched a lot of videos on the topic, trying to decide between salt, hairspray or a dedicated fluid medium of some kind. I happened to be in my local scale model shop one day and I saw this Vallejo chipping fluid so I picked it up. The short version: Gets the job done. I can’t say this is an effect I’d want to use on infantry, but on vehicles I think it’s worth the effort. You have to underpaint a layer of undercolor (usually rust), then a layer or two of the medium, and then the ‘real’ color on top of that. It’s a lot of extra work. 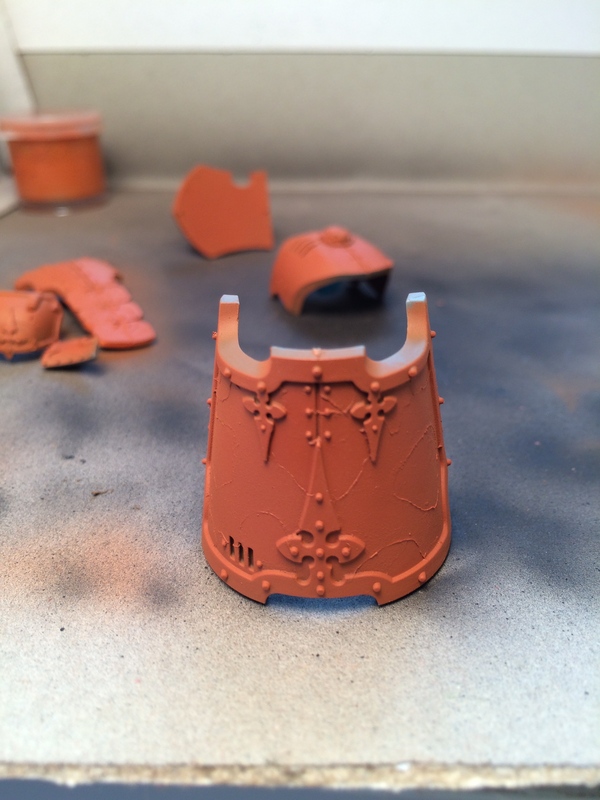 If you have an airbrush, however, it’s much, much easier. I tried brushing it on a test piece and it was a bit of a struggle, to be honest. More on that later. There are many ways to make a model look like it’s been around the block a few times. 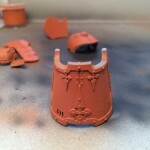 Paint weathering techniques are often broken down into two major camps: subtractive and additive. Simply put, additive is when you add some painted effects on top of your basic color, while subtractive is about removing the basic color to reveal something underneath. 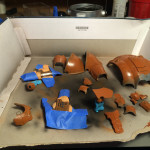 Paint chipping with a fluid is subtractive, and it’s only one method out of many. 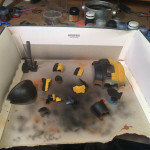 In the case of my Imperial Knight, I thought long and hard about how to weather it, and I opted for primarily subtractive methods to enhance the look of paint peeling in layers. Chipping fluid like this is a great way to do it, as it yields predictable results with enough randomness tossed in to look realistic. Additive methods like sponging or brushing paint on can quickly look artificial unless you’re very careful. So how does chipping fluid work? It’s pretty cool. 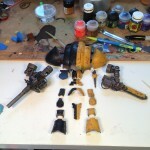 Basically, you pain a rust layer all over the bits you want to weather. There are many ways to do this, but the main point is to get the color you want to show through the peeled paint. In my case, I was going for a rust color that would look okay under both black paint and golden yellow, so that dictated my tone. I didn’t go too crazy with variations in color, as I expected only smaller bits to be peeled off. Next, I thinned the chipping medium down with about 30% water, and shot a generous amount of through my airbrush to cover all the rust. It’s glossy, and frankly I was a little concerned because it appeared rather thick and gummy. Moreover, there was a distinct ‘orange peel’ texture of micro dimples in the finish. Do not panic. It’s fine and this all goes away soon. Keep calm and carry on. I let this layer dry overnight just to be sure. 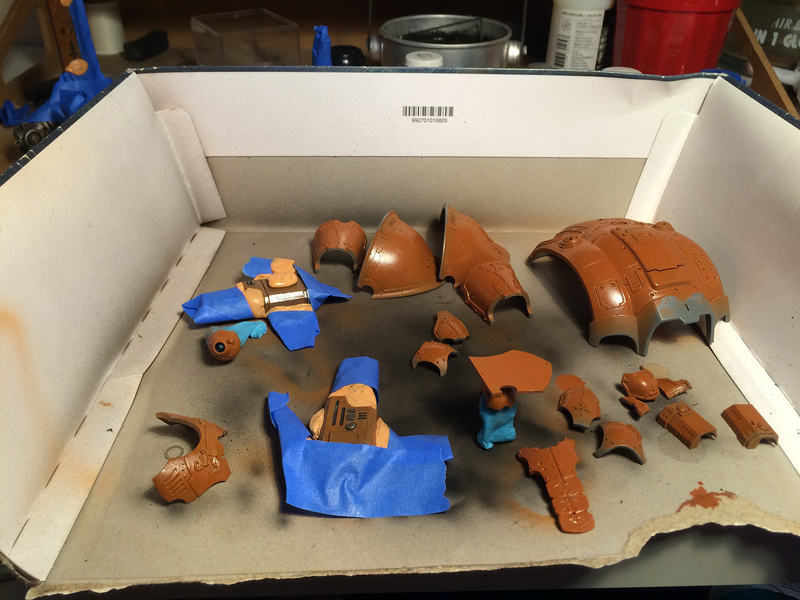 I then sprayed the actual base color right over the fluid layer. You’d never even know it was there if you left it at that. Here’s the fun part… To achieve the chipping effect, you simply add water and agitate the paint to cause little bits of it to flake off. I used everything from the dull side of a hobby knife, a stiff drybrush, a stiff plastic-bristle cleaning brush, some q-tips (cotton buds across the pond) and even some toothpicks (or cocktail sticks, if you please). They each distress the paint differently, and it requires some playing around to get just the effect you want. The less stiff the item is, the more random and tiny the effect is. With the paint brush, I was able to just get little pinpricks, spread out very randomly. It looked a lot like salt weathering techniques that way. The larger patches looked really cool on the Knight’s armor, simply because there’s a lot of room to work with. Things like rivets and the edges of armor plates or panel lines tend to be the first to distress, just as you’d expect. I gathered from YouTube videos and tutorial websites that this chipping fluid takes a little more agitation to give up the ghost. Some fluids, or hairsprays really, seem to take very little rubbing before they’re sloughing off in sheets. This stuff seems tackier, almost like a light adhesive. This makes it far easier to control and thus, less likely to make it look like just little scraps of paint sticking onto a big rusty field. Some may prefer fluids that take less work on the backend, but I think this is much better suited to my style. I was able to achieve the look I was after with just a little effort and I never thought it was getting out of hand. The cons? There’s a big one. I’ll say this now… This doesn’t work well if you don’t have an airbrush. I brushed some on a test piece and it was pretty much a disaster. The fluid was a bit hard to control because of the odd gooey consistency. It’s viscous and clingy, so it just wants to hang on your brush as you push it around. It’s almost like slime. When I went to brush paint over it, I immediately noticed it crazing and cracking, similar to the effect of the Agrellan Earth technical paint. To make it even worse, when I brushed over a bit a second time the paint refused to stick at all, and it came away in a sloppy mess. 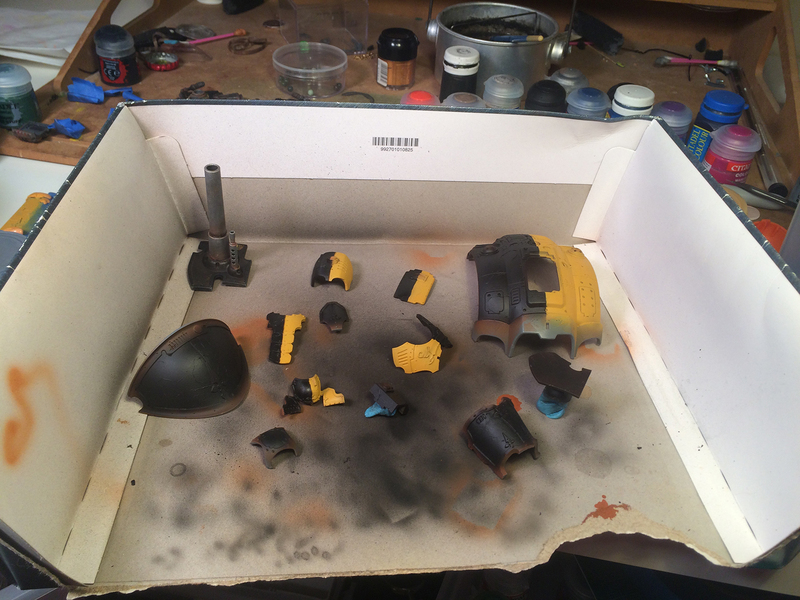 What was happening was my water-based paint started to ‘melt’ the chipping fluid before I wanted it to. Makes perfect sense, but it didn’t occur to me until it was too late. Luckily it was just a test so it wasn’t a big deal. 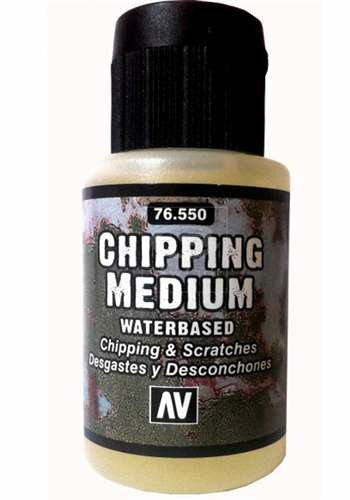 If you’re interested in weathering a tank or other larger model, and you own an airbrush, Vallejo Chipping Fluid is a great tool to keep in your arsenal. I love the predictable nature of the result, so I don’t feel like I’m going to mess something up by using it. I don’t think I’d feel so confident doing something like salt weathering or even hairspray, from what I’ve seen and read. It’s fairly cheap and I think this little bottle should last me quite a while. What do you think? Have you tried other fluids or techniques that you think might work better? Have some questions about how I used it? Mention it in the comments below.